Klayman: What About Farrakhan Too? 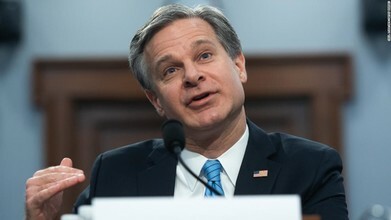 Washington (CNN)FBI Director Christopher Wray said Thursday that white supremacy presents a "persistent" and "pervasive" threat to the United States, breaking from President Donald Trump, who has sidestepped questions of whether white nationalists present a growing problem. "The danger. I think, of white supremacists, violent extremism or another kind of extremism is of course significant," Wray said at a House hearing. "We assess that it is a persistent, pervasive threat. We tackle it both through our joint terrorism task forces on the domestic terrorism side as well as through our civil rights program on the civil side through hate crime enforcement."